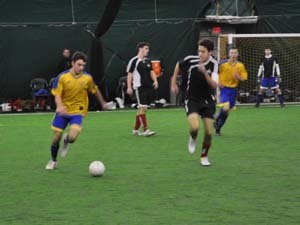 Armonk Indoor's competitive leagues are a great way for teams to maintain and improve their level of play, and to prepare for the spring season. Teams play one game each week. Games are played on either a third, half, or full field, depending on age and league. For more information, contact us at soccerleagues@armonkindoor.com. U8 Sat, 10:00 a.m. Sun, 1:00 p.m.
U9 Sat, 10:00 a.m. Sun, 3:00 p.m.
U10 Sat, 12:00 p.m. Sun, 4:00 p.m.
U11 Sat, 2:00 p.m. Sun, 5:00 p.m.
U12 Sat, 5:00 p.m. Sun, 6:00 p.m.
U13/14 Sat, 6:00 p.m. Sun, 7:00 p.m.
HS Fri, 7:00 p.m. Sun, 8:00 p.m. Note: Dates and times may be subject to change.